Smell: Figs, raisins, burnt toast. Taste: Really complex. Raisins, figs, toast, and so much malt goodness. Reminds me of a stronger and slightly better version of the Dogfish raisin beer (can't recall the name). Really good, but as I'm drinking, I can't help but still feel that it may not be quite special enough for the $11.99 pricetag. Mouthfeel: Alcohol is fairly well concealed given the abv. A little sticky. Carbonation level is quite low. Overall: Glad I tried it, and it's a great beer, but I can't justify paying $11.99 for 9.5 ounces of this in the future. Worth trying once and sipping on that special occasion. Sampled as a vertical in tasters at a barleywine tasting event. 2014 tried alongside 2001. The 2014 barleywine was delicious - a bright, young barleywine that was not overly saccharine despite having the classic robust malt presence. Trace hints of hop, and a less heavy mouthfeel contributed to an autumnal palate. Excellent. The 2001 extraordinary. An incredible window into what can happen within the confines of a bottle over a decade and a half. Gone were the light, youthful notes of trace hop and sugars. They were instead replaced with a toffee, caramel syrup. Notes of dates and figs more prominent than in almost any bottle I've tried before. A true treat to try 15 years aged. This is absolutely a standout barleywine. One of my favorite instantiations of one of my favorite styles. Had a 2001 vintage in 2016, and it was unreal. Sweet, mellow, toasted malty, Madeira, caramel. Literally everything I had hoped and imagined an English Barleywine could be. We were blown away, and hadn't expected much for something that sits on shelves for years. But to our taste a far superior beer to BCBW and almost any other Barleywine I've tried. Bottle direct from the brewery. Deep auburn with a thin wispy head. Yeast floaters apparent. Rich aroma. Multitude of rum infused fruit. Alcohol is noticeable. Slightly oxidised sherry notes. Toffee. A mellifluous concoction. The taste reflects the bouquet and more so. Very sweet. Unctuous in nature but nevertheless has high drinkability. A very enjoyable experience and 2008 - 2016 inc' yet to be drunk from my cellar. May 2017 - Vintage 2016 - Dark marmalade colour. Flat. Treacle. Sweet again. Definitely needs ageing. Overall = 4.00 Retasted Aug 2018. Candied fruit. Still needs more time. Autumn 2012 edition. Pours hazy, orange-brown in color with minimal head. Taste is cognac, beachwood, cedar, and big toasted malts. Very sweet, heavy bodied, with low carbonation. Overall makes for a tasty malty sipper. Similar to other JW Lee's barleywines. I will get this again and see how this tastes with more age. 2001 vintage. Pours a very dark brown. Still a bit of carbonation on this 15-year-old beer. A minimal skiff of tan head. Aroma is a dream of malt. Fine leather, tobacco, toffee, dark fruit, peanut butter and vanilla. Crazy. The taste starts off rich, sweet caramel and plum. As it flows over the tongue, I pick up leather, tobacco, peanut butter, chocolate and chocolate cake. Each sip seems to bring new tastes. Sweet and rich throughout. Mouthfeel is medium and sticky. Lusciously malty and sweet. Tastes heavenly. Dark bread and chocolate. Toffee. Ripe fruit, musky melon and cherry. Lingering sweet chocolate. Modest tea-like bitterness comes through in finish. Dark golden brown. Almost no carb, perhaps 2% of a baby beer. Serious yeast cake in bottle. Thick and syrupy. 2014 vintage. "Cellar Release 12-2014." 275 mL bottle. Look: Deep amber and cloudy. The color is beautiful though, it seems to shine in the glass. Small off-white head with poor retention and sparse lacing on the glass. Smell: Rich malt aroma. Bread, caramel, toffee, dark chocolate, raisin, sherry, butterscotch, maple syrup, and a hint of alcohol. There's an underlying orange marmalade smell too, possibly from the hops. Complex and awesome. Taste: Rich malt flavor to match the aroma. Caramel stands out the most but plenty of raisin and maple syrup as well. Sweet, long lasting finish. Feel: Despite being so rich it's surprisingly light on its feet, landing somewhere around medium to medium-full bodied. Sticky and​ chewy with not much carbonation. Warming at the end. Overall: A world classic and well deserving of it. A big English Barleywine that boasts a strong and complex flavor profile without ever feeling too heavy. Highly recommended for novice and seasoned barleywine drinkers alike. Big thanks to jtrockchalk for getting me this a few years ago. This will be the oldest beer i've had. Enjoyed on Dec. 1, 11 years after the bottling date (Dec. 1, 2000). Appearance: A lop-sided light brown head forms, 1-2 fingers. Am opaque body that looks brown but actually has strong deep red hues. Lots of coating on the glass as i swirl. Smell: Strong leather, musty, earthy, toffee, dark cherries, wood raisins and figs. Constant and strong aroma. Very nice. Taste: Wow, this is rich! Raisins, fig newtons, caramel, dark fruits (mostly cherries, not tart), caramelized sugar and fruit cake. Decadent, sweet but not cloying and just great. Mouthfeel: This has literally alcohol heat on it. Deceivingly easy to drink, smoothness is incredible and just a slight bit syrupy but i still like it a lot. Overall: This drinks so well. Great flavor. One of my favorites and a highlight of this year. Vintage 2014 bottle poired into a snifter at Hopcat Chicago. Minimal head/retention, cloyingly sweet even for me but still a very satisfying experience and quite representative of the style. I tried some of the 1980's vintages and was disappointed. This is 2000 and it's wonderful. It smells good from two feet away. It's huge! Al K Hall (we all know him) aroma is attractive. I get raisins and caramel ( again from two feet away) The mouthfeel is velvet. This is the nightcap beer! Stock up. 2001 edition I had been eying at Bubbles for some time now. A- Poured into a tulip glass. About a 20 second head only a 1/4 inch high. A ring of lace around the edge. It has the color of dark maple syrup. S- Coffee, chocolate, toffee, molasses rotate in the nose. It smells heavy and sweet. T- the flavors melt onto the tongue. Toffee comes out on top. It feels like it is soaking into my mouth. Very Very sweet. Almost too sweet for me, but very mellow. M- Pretty heavy body. It has the consistancy of Maple syrup, so it is thick and sticky, but also very fluid. I enjoyed the feeling of just holding it in my mouth and let it soak in. Almost no carbonation, I think the alcohol is creating more of a tingle. D- This is a powerful beer. I would like to try other editions to compare. I am going to get more of these, but only to pull out for special occasions. This is not a casual beer, something you couldn't drink on a whim, or should you. 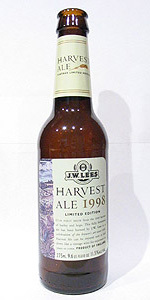 1998 bottle - a 10-year old brew! Pours a thick, murky orange-brown, with a very nice head. Smells rich, caramel and syrupy. Taste does all sorts of things. Sweet and ripe overall, with a caramel/maple syrup flavor. Tastes a heck of a lot like raisin bread as well. Some alcohol in the background somewhere. Very complex and dynamic. Definitely one to be slipped slowly. Drinkability hampered a bit due to sweetness and thickness, I wouldn't want any more than they put in the small bottle. This was quite the experience though. I won't be buying another one soon due to the price (almost a dollar an ounce! ), but certainly a very nice English barleywine here. A - Pours a nice copper color with a thin head that leaves a ring around the glass. S: The aroma is pretty much what I expect from the style. Raisins, caramel, molasses.I detect a bit of an earthy aroma hidden away also. T: This is where I was totally disappointed. The raisins, caramel, and molasses from the nose were in the taste. There was also a bit of toffee and brown sugar. The problem was this underlying taste of an uncooked potato. It was like biting into a raw potato. I found it unpleasant and it had enough of a presence that I couldn't finish this beer. This was a drain pour after only a few sips. M: This was thick, sticky, and sweet, more so than I expect even for this style. D: Obviously the underlying taste of a spud was off-putting for me. The thickness and sweetness definitely didn't help. In order to ensure it wasn't a bad bottle, I later picked up 2007 and 2009 vintages from different locations. It seems that something in this beer isn't sitting well on my palate. I thought this beer was very sweet and almost bordered on being a dessert beer. But yes, it is an excellent English barleywine that packs a ton of flavor in a small bottle. 2010 Vintage 1/23/2012 similar to 2009 Vintage but flavor is alcohol, sweet dark fruit and hints of cardboard. Also $8.99 for a 275ml bottle from Julio's Liquors, Westborough, Ma. 2009 Vintage 1/5/2012. Pours a one-finger cream head that fades quickly to a ring leaving traces of lace. Brown murky color. Light carbonation and medium-heavy bodied. Alcohol and dark fruit nose and flavor is alcohol and sweet dark fruit, paper like finish. Pricey, $8.99 for a 275ml bottle from Julio's Liquors, Westborough, Ma. Rates a 4. 2005 Vintage 10/26/2010 Straight up pour and no head, no lace. Cloudy dark brown color. No carbonation and medium-heavy bodied. Dark fruit and alcohol nose. Flavor is sweet dark fruit and alcohol, slightly cloying with no carbonation. $13.99 for a 275ml bottle from Beverage Warehouse Winooski, VT. Rates a 4. 2008 Vintage 10/12/2010 Pours a one-finger cream that fades quickly to a ring leaving a little lace. Cloudy amber color. Very light carbonation and medium bodied. Dark fruit and alcohol nose. Flavor is sweet raisins and alcohol, almost cloying because there is not enough carbonation. $7.99 for a 275ml bottle from Colonial Spirits Acton, Ma. This rates a 4. 2002 Vintage 9/22/2010 Pours with virtually no head and no lace. Cloudy brown color with some yeast left in bottle. Very light carbonation and heavy bodied. Sweet alcohol and dark fruit nose. Flavor is dark fruit and alcohol, almost cloying. $10.99 for a 275ml bottle from Beverage Warehouse Winooski, VT. This rates about 4. 2006 Vintage 3/17/2010 Pours without a head so no lace. Deep brown/amber color with a ton of floaties. No carbonation and medium bodied. Alcohol nose. Flavor is sweet alcohol, with some dark fruit; strong alcohol finish. Did not cellar well, good flavor but the carbonation is gone. $10.40 for a 275ml bottle from Colonial Spirits Acton, Ma. This rates about 3.5. Reviewed blindly courtesy of Blind BIF #6. 9.3oz bottle poured into Duvel tulip. Appearance: Cap cracks with a nice hiss, and I slowly pour into the glass careful to watch out for sediment once I see the dark liquid and smell the liquor. Head is a fluffy finger and a half of very light tan. Lacing is pretty and covers most of the glass. Smell: I immediately smelled some sort of liquor when I popped the cap. I get notes of vanilla, caramel, and sweet dark fruits - dates, prunes, raisins - a lot going in here. There is a hint of wood and some definite must. This guy is both barrel aged and cellared for a while. The aroma is simply intoxicating. Taste: How does one quantify "awesome"? Lots of that delicious dark fruit in the flavor, plus wood, slight oxidization, caramel and toffee, vanilla, maple, and a very smoothly blended liquor that is rather difficult to pin at this point. I'm going with port, but this could be sherry. Alcohol taste is smooth but strong - definitely a potent beer. Mouthfeel: Good carb and full bodied. Nice and smooth, but syrupy. Drinkability: High. This is a sipper all the way, but wow is this drinkable. Each sip makes me yearn for the next. It's just the right mix of sweet and alcohol. Overall: This beer is sublime. I could happily drink this for the rest of my life. The hazy apricot color was pretty brilliant, to be sure, but the smell was perplexing. At first I thought I'd accidentally picked up a wild ale. And, hell, maybe there is some spontaneous fermentation going on in this beast, I wouldn't know, but the thing smelled like bread at first. Not sweet bread, but, like, buttered white toast or something. It has a somewhat sour note to it like sourdough. It put me off at first, but then I poured it from the bottle into a glass. The taste is incredible. Massive caramel bomb, to the point that I almost feel like I'm tasting some salt in this. Certainly very sweet up front, reminiscent of sherry but not nearly so raisin-y, though a little bit of white grape juice. Let's call it vinous but without getting raisin-y, if that makes sense, but then it flips a little and the huge caramel/sherry notes fall to earthy hops and a surprising smoky, burnt honey/sugar character. So you have a strong beginning and end, two very distinct vibes, and yet in the middle is more complexity than I recall ever enjoying in a barleywine. Great, great stuff. Somewhat overcarbonated, not that I expected it to be flat, but there was juuuuuust a bit too many prickles in the mouth to render this beer as smoothly as I feel it ought to be. Medium but thick, though the hops and the smoke (wherever that comes from) cuts the sweetness so much that it never becomes cloying. Heaviness is less than some of my favorite imperial stouts and yet I sipped on this a lot slower than any beers in recent tastings. The smell certainly improved as it warmed, going from a savory, yeasty bread to that caramelly/chocolatey cake that most people were talking about. Overall, the most interesting, complex barleywine I've had, possibly, ever. I'd have to give Sucaba another taste test (as when I had it I was barely a young pup when it came to craft beer, though I loved it), but I'm confident this is just as good and I imagine probably better. Amazing stuff, if you see it under $8, even for just 9.3 oz, buy it. It's the only beer in that price range I've ever bought that I'd say was worth it. Got this as a gift a year or two ago. Waiting for a good time and today is that day (night before my 51st - as good a time as any). 1999 version. Pouring into a Sierra Nevada 20 oz pint glass (one of my favorites). Quiet and soft pssst. Rich and creamy pour. Sugary and pale malt aroma. Toffee. Alcohol. Dense creamy tan head that leaves a thick lacing. A surprising amount of bubbles rising in a relatively clear liquid of dark amber of red/brown/gold. Still good looking even with this age on it. Oh! The flavor. That's heaven. Quite sugary and candy like and a flavor that lasts a good long time before the moderately hight bittering and eventually the touch of dryness in a stamina driven finish. Amazingly hidden alcohol. There is no hesitation to have another sip. 11.5% no way. That's really impressive. Creamy body and great smoothness. Not the thickest barelywine I've had, but thick enough to enhance the experience. Drinkability is high in part due to the hidden alcohol the balanced flavors at finish and a 9.6 oz bottle. I'd have to be careful, but having a second would not be a problem.